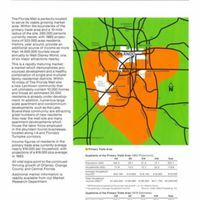 This report provides demographic statistics for the region surrounding the Florida Mall. The mall was designed and constructed by the Edward J. DeBartolo Corporation, founded by Edward J. DeBartolo, Sr. (1909-1994) in 1944. Edward J. DeBartolo Jr. (b. 1946) joined his father's business and together they became known as the "kings of the shopping mall." By the late 1980s, the DeBartolo Corporation had constructed 51 shopping malls, including 21 in Florida. 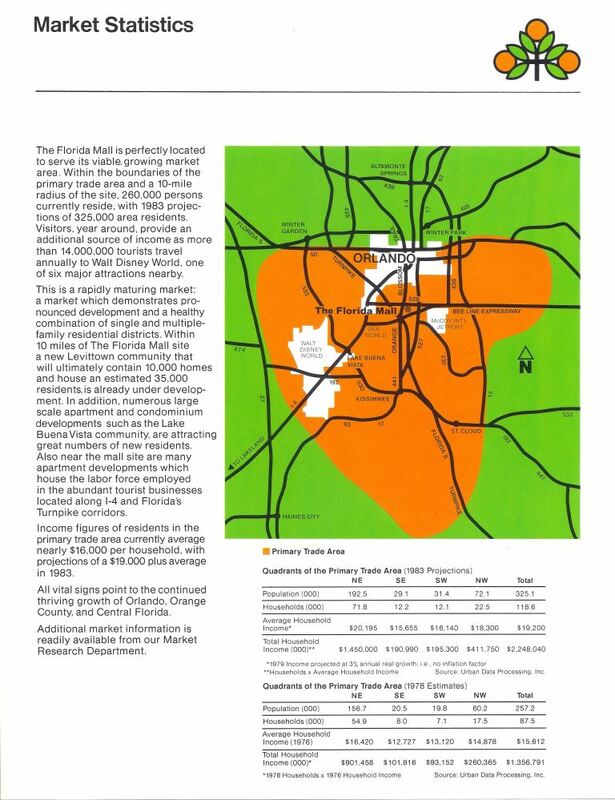 The Florida Mall, located on the corner of Sand Lake Road and Orange Blossom Trail, was designed to appeal to Central Florida's large tourist economy and opened in March of 1986. Originally, the mall sat on 250 acres, contained over 1.3 million square feet of shopping space, and featured over 160 stores. Original typed flyer: Pine Castle Historical Society, Pine Castle, Florida. Digital reproduction of original typed flyer. Originally published by the Edward J. DeBartolo Corporation. Copyright to this resource is held by the Edward J. DeBartolo Corporation and is provided here by RICHES of Central Florida for educational purposes only. Crawford, Selwyn. "Edward J. DeBartolo Sr. bristles at even the slightest….'" The Orlando Sentinel, June 15, 1986. http://articles.orlandosentinel.com/1986-06-15/business/0230120196_1_DeBartolo-shopping-malls-mall-in-south. “Florida Mall Market Statistics.” RICHES of Central Florida accessed April 22, 2019, https://richesmi.cah.ucf.edu/omeka/items/show/7013.